As so many Iowans are dealing with excess water lately due to flooding, we’re reminded the resource is precious and not to waste it. Residents in towns where water treatment plants have shut down already know the value of fresh, clean water. Don Tormey, spokesman for the Iowa Utilities Board, says we should all check our homes for sources of drips to save water — and money. A federal report finds 10 percent of homes have leaks that drain more than 90 gallons a day, typically through worn toilet flappers, faulty valves and dripping faucets. He suggests you check your water meter before and after a two-hour period when no water was used. A change in the meter reading indicates you could have a leak and there are a few ways you can check. 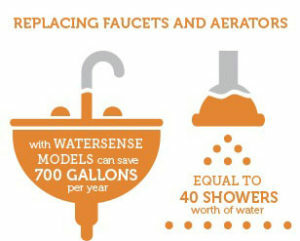 Learn more about leaks and water conservation at the website: www.epa.gov/watersense.